When most of us plan a new kitchen design, we start thinking about how it’ll look. Stunning new white cabinets. Polished quartz countertops. Modern pulls and knobs. But planning a new kitchen is actually an opportunity to improve your existing layout and design. Research shows that by laying out key elements of your kitchen in a certain way – the fridge, stove, sink, and areas where you prepare food – you can improve your cooking workflow. 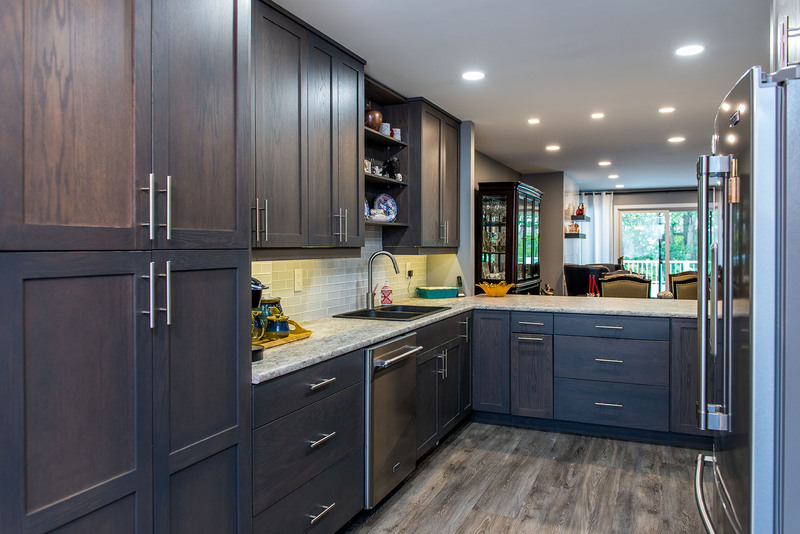 Take the time to learn about what makes a functional and effective kitchen design so you can plan changes that will make your kitchen work as hard as you do. The kitchen work triangle theory was developed in the 1940s and it’s been a part of well designed kitchens ever since. The design is all about efficiency. If a kitchen is laid out according to the work triangle, you’ll be able to move swiftly between three anchor points in your kitchen: the refrigerator, the sink, and the stove. With the focus being on limiting the number of steps you need to take, this design can indeed be a excellent starting point that helps you work efficiently and effectively while preparing meals. The kitchen work zone theory involves organizing your kitchen around three zones: prepping, cooking, and cleaning. Planning your kitchen design according to this theory involves grouping all your resources for each function in the same area. To start, the prepping zone is where you likely do the majority of your cooking. This area should be in close proximity to the refrigerator and your dry goods cupboards to minimize back and forth as you begin preparing the meal. Having the garbage receptacle in this area will help you dispose of waste as you work on your meals. The cooking zone is the area surrounding the stove, oven, and all cooking related appliances. To make the cooking process run smoothly, this zone should be located either right next to the prepping zone, or directly opposite it. This will enable you to move easily between the two. Finally, the washing zone, which features your sink and dishwasher, can be separated from the other two zones. Ideally, this zone should be near the cupboards that hold your dishes, so you can unload your clean dishes with ease. Many kitchens are used for more than just prepping, cooking, and cleaning. They can also function as the heart of your home, where friends gather to share a glass of wine or family members hang out and discuss their day. You can add an additional zone for socializing by extending your countertop and adding some bar stools to the kitchen. This allows your kitchen to be a social place, by allowing friends and family to hang out and chat while you’re preparing a gourmet meal. You can get ideas for a wide range of kitchen designs by viewing recently completed kitchens in our inspiration gallery.